What goes into a wedding? What if I need a delivery outside normal business hours? What are your showroom hours? If you’ve been planning your wedding for any amount of time now then you already know it’s a lot of work. Making the tough decisions (“Do we really have to invite Aunt Esther?”), coordinating with dozens of vendors, and keeping yourself sane are just a few of the obstacles you’ll have to overcome. But what do your wedding vendors do? If you answered “just show up and get paid” then keep reading to learn what the staff at All Events is doing to help make sure your wedding is a huge success! Almost every client comes to us for the first time completely unsure of what the next step is. It’s normal; you’ve never planned a wedding before. Luckily our Event Representatives have. This initial consultation (the first of many) is when we show you what we have to offer, both our products and our people, and let you gauge the quality of our work. It’s important that you’re comfortable with us because we’ll be working very closely together over the coming months. At the same time, we’re getting a feel for you; your style, your budget, your expectations; all of which help us tailor a solution to your specific needs. During this initial consultation, your Event Rep will discuss with you details such as your guest list, the ceremony and reception locations, and your linen and tableware options. Don’t worry, you don’t need to know the answer to everything yet – there will be plenty more consultations to come. Depending on your level of certainty in what you want, you may leave with some ideas, or maybe a quote. But once you know what you want and you’re ready to retain us for you wedding, your Event Rep will walk you through the creation of a reservation. This is a contract of our commitment to you, and your commitment to us. It lays out in black and white exactly what we’re providing, what you’ve agreed to pay, and the retainer required to reserve our services. On it you’ll find general information about us like our address, phone number, showroom hours, and website; and we’ll find contact information for you such as name, mailing address, and phone number. But most importantly the reservation is a complete record of every single detail we’ve gone over about your wedding. There’s a product listing showing how many, which style, and what configuration. The delivery and pickup section lists the when and the where, plus who our on-site contact person is (hint: it’s not usually the bride). And finally there’s a comment section, where we can write out, in detail, all of the little important bits that don’t fit anywhere else. It’s vital that you read through the reservation with your Event Rep to make sure that everything is covered and understood. Once we’ve crafted a reservation for you and we’ve received our retainer it’s time to get started. For locations we’ve been to before (most hotels, reception centers, banquet halls, country clubs, and rented barns in the area) this means giving them a call to let them know how we’ll be involved in your wedding, our expected time line, and whether they have any requirements or special requests. For locations we’ve never been to before (a tented wedding on private property, for example), this means a site visit from one of our Delivery Team Leaders as soon as possible. During the site visit we survey the location and make any measurements and notes that are of importance. We then enter all of the information into our CAD system to ensure the proper size and fit, and to check for any potential problems. If we run into anything that concerns us, your Event Rep will contact you immediately and arrange a time when you can meet with a Delivery Team Leader on site to discuss the issue and our suggested solutions. Assuming there are no major issues during the site visit, we wait for the followups. The followups are any number of additional consultations that take place with our Event Reps before the wedding either in person, through email, or over the phone. For simple events, there might only be one followup a few weeks before the wedding to confirm the guest count. For more complicated events there may be a new followup every week or every other week to discuss additional ideas or changes. There’s no limit to the number of followup consultations you make, so feel free to contact us frequently. We’re here to help, and the more organized we can be during the months leading up to the wedding, the more smoothly everything will happen during the wedding. At some point during one of your followups you’ll probably want to see a play table, a mockup of your table design created to allow you the opportunity to see what your tables will actually look like. You’ll get to see your exact table, completely set with chairs, covers, ties, linens, plates, goblets, silverware, centerpieces – everything you’ve asked us to supply. This is the perfect opportunity to invite your other vendors to see the design as well; your florist is especially useful to have along for this followup. There’s no extra charge for your play table, and you can come in as many times as necessary; sometimes it takes 3 or 4 visits before you’re happy with the design. However, your play table visit is one of the few times we require an appointment, which allows us enough time to have what you need in stock and get your table set and ready for you to see. After your second-to-last followup – typically after your RSVPs are in – we begin the preparation. 30 days before your wedding our VP of Operations pulls all of your paperwork and begins the process of double-checking for any potential conflicts or concerns. The most common problem? Linens. The turnover rate for fabric is incredibly high, with the destruction of things like tablecloths, napkins, and chair covers an almost daily occurrence. Making sure the proper size, color, and quantity of linens are available is the first step in the preparation process, and by checking this information a month in advance, we’re assured plenty of time to order replacements and have them washed and pressed in time for your wedding. The week leading up to your wedding is a carefully choreographed ballet, with each aspect needing to fall into place in a very precise manner to make sure we’re ready on time. First, the VP of Operations schedules your delivery and then follows up with you one last time to ensure there are no last minute changes to be made. Next a member of our IPMD (Inventory Preparation, Maintenance, and Distribution) Team prints your pull order, which is a modified items-only list of the products you need, and then begins creating the labels that will be applied to each and every item on the list. These labels are compared against the pull order to confirm the proper items and quantities are being pulled (Confirmation 1 of 5). If we’re lucky, all of your items are in stock – meaning cleaned, processed, and ready to be labeled. More than likely though, we first need to return the items from a previous wedding before we can get them ready for you. This includes cleaning and sanitizing all tableware in our commercial dishwasher, washing linens in our industrial washing machine and then pressing them in our massive flatwork ironer (lovingly nicknamed “The Mangler”), and hand cleaning all centerpieces. As this work is being completed the IPMD Coordinator counts and label your items, confirming each labeled item against the pull order (Confirmation 2 of 5). Next, the Delivery Team begins pulling your order from the warehouse to the truck, comparing the labels on the items against the pull order and recounting each (Confirmation 3 of 5). As each item is loaded, the Delivery Team Leader checks for any discrepancy between the pull order and the reservation, and then compares the reservation to the item labels (Confirmation 4 of 5). Finally, after a full week of work and careful coordination, your order is ready for delivery. Immediately before leaving for delivery, your reservation is converted to an open contract, indicating the items are now en route. Prior to leaving the warehouse, the Delivery Team Manager compares this open contract against the previous reservation to confirm there have been no undocumented last minute changes. With their final preflight checklist complete, the Delivery Team departs. Depending on the size and complexity of your wedding, the delivery process could take anywhere from one to 36 hours to complete, spread out over multiple days leading up to your wedding. This is where the careful planning and organizing we’ve done together pays off, as once on-site our Delivery Team works smoothly and efficiently to realize the plan we’ve crafted to your exact specifications. As the final step before leaving, the Delivery Team Leader once again compares the open contract with the item labels to confirm that the correct items and quantities have arrived (Confirmation 5 of 5), and double checks with our on-site contact person that everything is as expected. At this point everything is complete, and you get to enjoy the wedding of your dreams. Depending on the timeline you’ve specified and the level of service you’ve requested, the Delivery Team may return immediately after your wedding, the day after, or several days after to begin the cleanup process. The first step is to reload the truck, using the open contract to confirm the correct items are loaded, and nothing is taken by accident. While we’re very careful to assure the correct items are being loaded, at this time we don’t worry too much about the exact numbers, as certain things (like linens, goblets, and silverware) are notorious for being misplaced. Once the truck is back in our warehouse and unloaded, the IPMD Team counts, cleans, and recounts everything, making notes of any issues, missing items, or discrepancies. Once the entire order is processed, we’re ready for the review. If we have a contact person that is not the bride or the groom, an Event Rep will typically call as soon as the order is processed to review the order and let them know of any issues on our end, and to find out if there were any problems on yours. In cases where the bride and groom are our only contacts, we make every effort to avoid calling while you may be on your honeymoon (within 10 to 14 days after your wedding). However, in cases where there is an immediate need (a one of a kind item is missing and is needed for an upcoming event), we will call if we feel it necessary. This review is your opportunity to let us know how we did and if there is anything we can do to improve, and we greatly value the feedback. And of course we always appreciate when our clients take the time to write reviews on wedding websites like Wedding Channel or Wedding Wire, or to hand write a thank you note. And there you have it. From start to finish the process can take anywhere from 9 to 24 months, and the coordination of dozens of individuals all working towards one goal: to ensure you have the greatest wedding day possible. When you take into account that most vendors are doing multiple weddings per weekend you can see why it’s important to choose reputable vendors with a high level of expertise and experience. 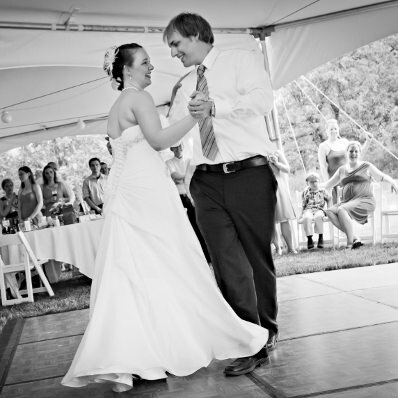 One of the most frequently asked questions we receive from planners is “How much dance floor will I need?” Here’s an easy formula to help you decide: Simply multiply the maximum number of guests (not dancers) by 1.3, and that will give you the approximate square footage you will need. The above formula works on the assumption that in most situations half of your guests will be wallflowers. If you think you’ll have more dancers than that, you can use a (slightly) more accurate formula which simply states that each dancer will need between 2.5 and 5 square feet of space. So, for 50 expected dancers you’ll need between 125 and 250 square feet. Easy, right? Of course, some dancers will need more space and some dancers will need less space. It’s up to you to decide which type you’ll have more of. Remember though: when in doubt, it’s always in your benefit to err on the large size. We will make every attempt to accommodate an unusual delivery time. If the requested time is extremely unusual (2am Sunday morning after the reception) we will charge whatever it costs to convince our crew to come in. We are located West of Arby’s on Winkler Drive in Wooster. Here’s a map. Can I borrow an item to show my fiancée/fiancé? We understand that it’s not always possible to plan a wedding or other event during business hours. If you need to borrow an item, like a centerpiece or linen to show someone, you can do so at no charge. We do require a credit card number to be on file for a security deposit. How much skirting will I need? The short answer is simply to measure the length of the tables to be skirted. However, if you’re working with rounds or funny angles, your best bet is to figure out how many tables you need skirted and call an Event Representative. Why do some linens cost more than others? To be honest, because some linens are more expensive than others. In general the more difficult the linen is to clean and press, the more we charge. White and ivory are easier to clean than colors, squares and rectangles are easier to press than rounds. In an effort to give you the best price at every level, we have to charge more when it costs more. What should I do in case of an emergency? If by emergency you mean life-threatening, what are you doing online? Call 911! If you mean a rental emergency (whew!) call our 24-hour Emergency Service line. Please note that this line is reserved for true emergencies – equipment failures and things of that nature. If you need to make additions or changes to your order, please call during normal business hours. I broke/lost an item, what should I do? First and foremost, please be honest; accidents happen, things get misplaced – you’re not the first. Unfortunately we will have to charge you; either for replacement or repair – whichever costs less. If an item has been lost, we’ll charge you the replacement cost; if in the future you find the item, bring it back and we’ll refund the charge.